Ms. Chaffee has Civil Engineering Degrees from UC Berkeley and Cornell University. After working in the field for many years, she devoted her time to raising 2 musical children, and volunteering in schools and church. As her children gained independence, she had time to sew. A creative out of the box thinker with a sense of design and a love of music, she made a Violin Purse. It grew into a whimsical music-themed gifts business, Violettes by Becky. 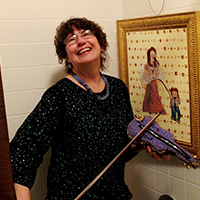 In Spring 2015, one of the Violin Purses won a place in the McGee Tyson Arts in the Airport Exhibition. In spring of 2016, Becky started creating whimsical music-themed paintings with acrylics on canvas. Most of Becky’s paintings are cheerful and brightly colored. They are very popular, and prints are currently for sale in New York, North Carolina, Nashville, Townsend and Knoxville. She photographs the paintings for greeting cards with witty Captions on the backs. Becky has several lines of greeting cards, which are available at a local Hallmark, the local University Museum, and the Knoxville Visitor Center. The majority of cards are from paintings that are based on both serious and humorous “Music Lessons” for instruments and voice. One gift card set is titled “Seize the Opportunity to Play” which shows people playing music in whimsical places. Another is “Musical Pets”. A collection just for pianists can be purchased. In addition, there are collections of “Tips for Playing in an Orchestra”, “Adult Practice Tips” and even an “Asian Instrument” card set. Due to an increasing number of requests for her wit and humor, she is veering in other directions with her paintings including local East Tennessee themes. Becky has filled special orders for paintings and has original works in several collections. Through her company, Becky raises funds for music education causes. Violettes by Becky holds an Annual Youth Composition and Songwriting Competition for ages 10 thru 18 and has distributed $1,000s in funds and prizes to youth. This is her 5th year of the competition. In the 3rd year of the competition 3 inner city arts school classes were involved from Oakland, CA, Philadelphia, PA and Flushing, New York. She has donated earnings for many sales to the local public school music programs.